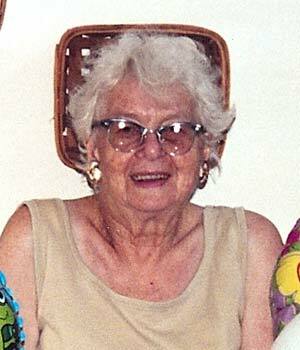 Edna Marie Cramer age 88 of Richwood, died Wednesday morning February 13, 2008 at her home in Richwood. She was born January 4, 1920 in Mingo to the late Earl and Lena (Newman) Weatherby. She was a homemaker who loved her grandchildren and her cats. Her favorite hobbies included fishing, reading romance novels and going to steam engine shows. She is survived by her husband, Ernest whom she married on July 7, 1951; 4 daughters, Beverly (Elmo) LeMaster, Cardington; Fern Cramer, Marysville; Faye Cramer, Richwood; Pat (Bill) Knear, Bellefontaine; 1 son, Herman (Pat) Heminger, Powder Springs, GA; 13 grandchildren and numerous great-grandchildren. Memorial Services will be held Tuesday, February 19, 2008 at 1:00 PM in the Stofcheck-Ballinger Funeral Home, Richwood. Burial will follow in Claibourne Cemetery. Memorial gifts may be made to Union County Humane Society, 16540 County Home Road, Marysville, OH 43040. I am so very sorry for your loss. My thoughts and prayers are with you and your family at this time. Edna was a wonderful wonderful lady. Our families go back many years and share many wonderful times and memories. i still recall the Easter egg hunts, beautiful birthdays together and let's not forget the go kart rides!! My deepest sympathy goes out to Faye and the whole Cramer family. #3 from: Caleb Williams, Jr. Sorry for your loss. She will be missed by all.